Just when you think you have seen it all, something else comes along and slaps you in the face. Dog Beer is for dogs ! It is non-alcoholic and non-carbonated and it tastes of beef. But fear not dog lovers, another brand is now available in the UK from petsathome.com. In my posting about the Brewery History Society I mentioned that the Journal had included a photographic essay cataloguing the final year of the Young's Ram Brewery in Wandsworth. Steve Lyne spent the best part of a year with his camera (and leads, laptop, lamps, tripods etc) and unrestricted access to the working brewery in its final days. Ken Don, Young's head brewer said "Steve has captured the spirit of what made Young's one of the most admired brewery companies in Britain. There is a warmth of feeling in these images which goes beyond the actual pictures and makes the reader feel part of the history, tradition and fun that working at Young's was all about." The photos are available to view in full colour at Steve's website www.lyne.co.uk and are available to purchase in limited edition prints - details if you scroll down here. 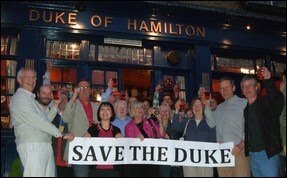 I am happy to add my support to the campaign to save the Duke of Hamilton in Hampstead. It takes two minutes to register an objection through the Camden website. If you have ever spent an afternoon or evening in this great pub, perhaps you might like to add your voice too. Duke of Hamilton, Hampstead. Latest News. closure by a similar campaign a number of years ago. They made one very clear point - 500 objections were lodged to the Pineapple's conversion. That carried weight. If everyone who receives this newsletter can, at the least, go to Camden's site and lodge an objection to both applications then we will have over 700 objections. So please get clicking, see details below. Clearly if you can embellish the objection with strong reasons against all the better but if you don't have the time, just object! It should only take a few minutes for each application. on-line objections is 30 June. At its AGM on Monday, the Heath and Hampstead Society joined the campaign by expressing their objection to the change of use. All Society members will be encouraged to lodge objections to what, if allowed, would bring about a massive change to the character of New End and indeed this whole part of Hampstead. I am also asking residents of Camden to write to their local councillors and MP Glenda Jackson, who has already expressed her strong support for the Duke staying as a pub. It's easy to do this for both councillors and MPs at http://www.writetothem.com and entering your home post code. site either later today or tomorrow. to write in to Camden Council. It is hoped that David Bedford, pub regular and London Marathon Race Director will come along. If you live close by why not pop along and see if you can help in any other way, say by delivering flyers. As much as I love drinking in London's pubs, and I guess the City is now going to see a bit more of me, I also love getting out of town and last week saw a visit to Grantham in Lincolnshire and the five pubs that appear in the 2010 Good Beer Guide. The highlight of the day was finding beers from the local brewery, Newby Wyke, in most of the pubs. I have had beers from Newby Wyke at beer festivals before and although always enjoyable they have never proved to be memorable. Well, that all changed on Tuesday. I don't care what anyone says, there is a clear difference between a quick half in a beer festival and a pint or two in the pub. The beers I had last week have moved Newby Wyke right up there into my favourites and "must drink whenever seen". The beers were fresh, clean tasting, well hopped, flavoursome and right up my street. They have been around for a while now and I guess they are on most people's radar but if they are rarities to you, I suggest you try them when you see them. I don't think you will be disappointed. One of their regular outlets is the Nobody Inn in Grantham. The strange thing about this pub is that the toilets are "secret". Push the door marked Ladies/Gents and you will find it locked. Push the adjacent bookcase and a hidden door to the loos is revealed. Another delightful curiosity that makes Britain's pubs so enduring. Thanks everyone for your congratulations. As you might expect I am still pretty excited about this. I pitched my taste buds against five other beer lovers at The Old Spitalfields Market this afternoon and after four flights of four beers trying to identify each beer, followed by a one minute speech I was the overall winner and will now hold the title of City of London Ale Taster for the coming year. Cheers all - more on this to follow, I dare say. Best news of the week is that I have been fortunate enough to be selected as one of the final six in the London Ale Taster competition which will be held this coming week. Forgive me for posting large chunks of the press release but I am spending every waking moment revising, researching and rehearsing - practice, practice, practice. Not strictly true but the event does look like it might be a lot of fun and it would be great to have some friendly support. Spitalfields, London, UK- Following last month's call for applicants for the ancient position of London Ale Taster, on Wednesday 9th June, London's historic Old Spitalfields Market will play host to an special beer event which will see six, short-listed candidates battle it out for the coveted role. The free event, which is open to the public, takes place at 1pm on the 9th June and will see the six contestants challenged with four tough rounds of ale tasting. They'll have to correctly identify unmarked samples of different ales and match them to a list - earning points for each one correctly identified. 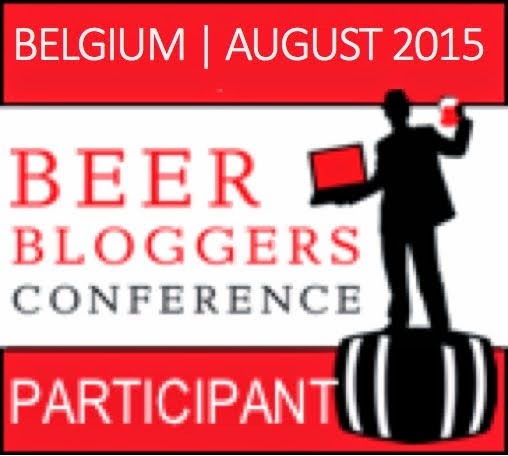 This will include a round dedicated to Porter, London's famous brew. In the fifth and final round, the six hopeful candidates will each have to make a one-minute presentation to a panel of judges, again earning points. The panel includes many well-known names from the industry, including: Pete Brown, a leading beer writer and historian; Steve Wellington, master brewer with the famous White Shield micro-brewery; George Philliskirk, representing the Beer Academy andknown to many TV viewers as the 'Beer Doctor' and Malcolm Ball, chief executive of the Wellington Market Company, the company responsible for Old Spitalfields Market and the revival of this historic role. The candidate with the most points will be crowned as London Ale Taster for 2010 and it is planned that this will become an annual event. The competition will, notably, be accompanied by a special 'beer market', which is open between 9am and 3pm, and feature some of London's best-known brewers - including some from further a field. These brewers will offer free samples to the public and sell their ales, in what could be described as a 'mini' beer festival. Brewers that are kindly supporting the day's event include Brodie's Beers (Leyton), Fullers (Chiswick), Meantime (Greenwich), Redemption Brewing Company Tottenham), Sambrook's Brewery (Battersea), Sharps (Rock, Cornwall), The Kernel Brewery (SE1 and the White Shield micro-brewery (Burton). The Beer Academy and Campaign for Real Ales(CAMRA) will also attend the event and promote their respective organisations activities. The general public are welcome to come along to the free event, watch the battle for the coveted role and try out some of the ales on offer in the special beer market. The role of Ale Taster (also known as Ale Conner) would have disappeared in the early nineteenth century and their duties would have involved visiting stalls and inns on market days and during the town's fairs to ensure that the ales, beers and other produce on sale were of good quality. "The new London Ale Taster will have a much more modern-day role." explains Malcolm Ball, chief executive of Wellington Market Company, the company responsible for Old Spitalfields Market. "The winner for this year's event will be given a weekly beer budget so that they can carry out the role of 'mystery drinker' in the capital's pubs. We'll set them up with a blog (website diary page) so that they can report back to consumers on what they find on their travels. "We are planning a number of food and drink-related events at our market this year and the successful candidate will hopefully preside over a number of beer-related activities, such as tasting classes, food / beer matching sessions and the launch of a new beer called Old Spitalfields Bitter (OSB) which we hope will be produced with the help of London's brewers. "I'd like to stress that the London Ale Taster is all about responsible drinking and in no way are we promoting binge drinking - I guess you could sum up the role with the phrase 'quality, not quantity'!" One of the London Ale Taster judges, Pete Brown, leading beer writer and historian, whose books have charted the history of brewing and drinking, added: "There's an unprecedented level of interest in great beer these days and a lot of that interest is coming from people who love locally sourced, flavourful, crafted food and drink of all types and don't see why beer should be any exception. 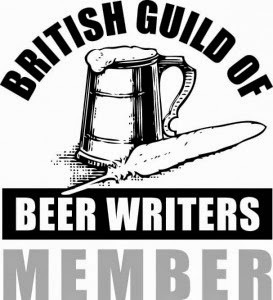 "This post should help spread the appreciation of beer even further and help turn more people on to the variety and depth of flavour in great beer - I think everyone is going to be surprised by how knowledgeable and passionate some of the applicants will be!" Old Spitalfields Market is a short walk from Liverpool Street Station and Aldgate East Tube - please visit www.oldspitalfieldsmarket.com for further information. I found this in a charity shop in Putney last week. Does anyone else recognise what it is ? The Ancient Order of Froth Blowers was a charitable group of beer drinkers that ran from 1924 to 1931 - at its peak over 700,000 had paid the life membership fee of five shillings which included a rather natty pair of cufflinks.